Fall weekends belong to friends, football, and foooood, food, food. With a bit of a chill in the air here in Nashville, I decided to create a killer tailgate recipe that will give you a bit of warmth back into your celebrations. 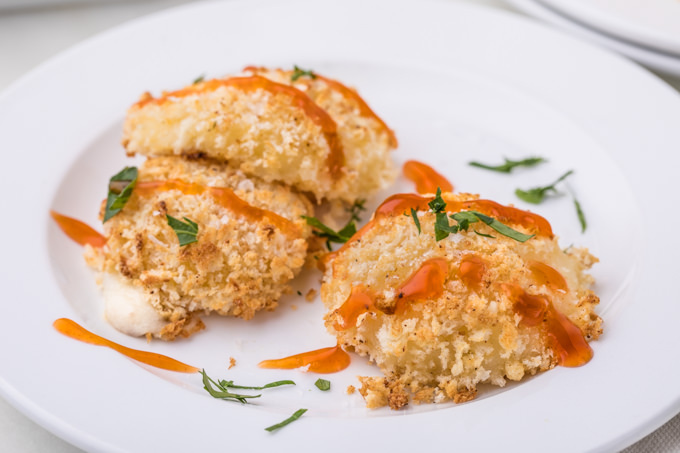 Crispy baked mozzarella bites drizzled with a sweet and spicy sauce and sprinkle of parsley. For the win, y’all. Now… It’s no secret that I’m not the biggest sports fan in the world. I love hockey, but football just doesn’t do anything for me. About 15 minutes into watching everyone stand in a line and wait to smack into each other and then wait another 15 minutes to do the same… ehhh. BUT, there is still some hope. What I do love is tailgating. Meet up with friends, maybe do a little day-drinking, and eat everything that you can possibly fit into your face. What could I possibly dislike about that? Why isn’t that a sport? I’d get off the couch for that. Now… down here in the south, there is a certain way that we do these things. You aren’t bringing that quinoa salad to the tailgate. Does a handful of kale chips keep you warm and happy? Pfft. It’s meant for good ol’ comfort bites. I’m talkin’ BBQ, burgers, and whatever bites make you feel cozy and ready for a nap afterwards. If basically hit the holy grail of tailgating ingredients with this one. It’s like BBQ sauce, but with a tangy kick. Honey-based sweetness with the classic quality of a brand that I have relied on and trusted to feed my parties for years and year. Sweet Baby Ray’s has a new sauce out called Honey Hot Sauce. You’ve seen the different recipes that I’ve whipped up with other Sweet Baby Ray’s products — Grilled Mustard BBQ Slaw (aaaaamazing) and Rotisserie Chicken BBQ Flatbread being some of my favs. Both of those would be a great fall party addition, really. If you can grill it, you can pour some sauce on it to kick things up a bit. Always. You’ll probably be able to find this sauce just down the street. Search here for available locations. This new Honey Hot Sauce packs a punch, y’all. It reminds me of a classic wing sauce but with a touch of added sweetness from the real honey that is blended in. I prefer this over a regular wing sauce because of that sweetness. The balance makes for an addictive addition. It just screams to be on party bites. 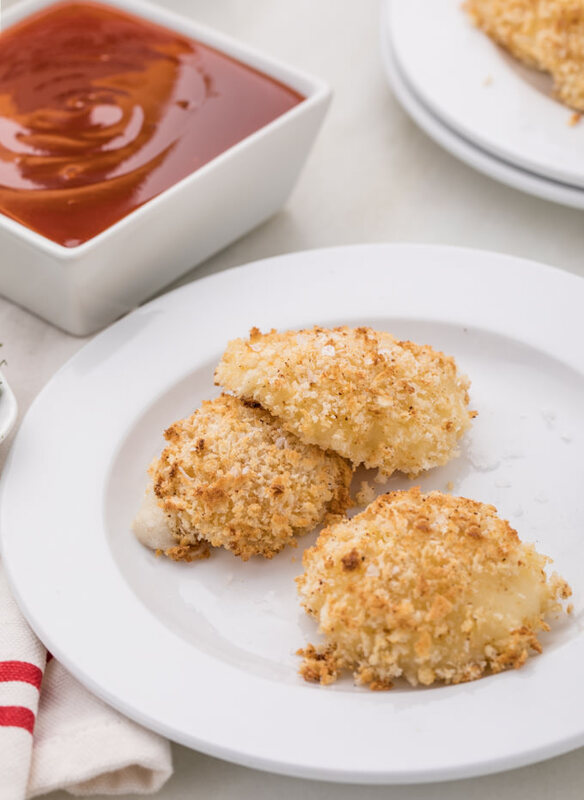 The gooey mozzarella bites have a crispy shell made from Cajun-seasoned panko. I’m all about simplicity when making a recipe with sharing in mind. Nobody wants to sit and spend a full day preparing snacks that will be devoured in minutes. These couldn’t be any more simple. Ball up some moz, freezer ’em so they don’t end up being cheese chips in the oven, and bake (or fry if you are feelin’ fancy) and drizzle until your honey heat lovin’ heart is content. 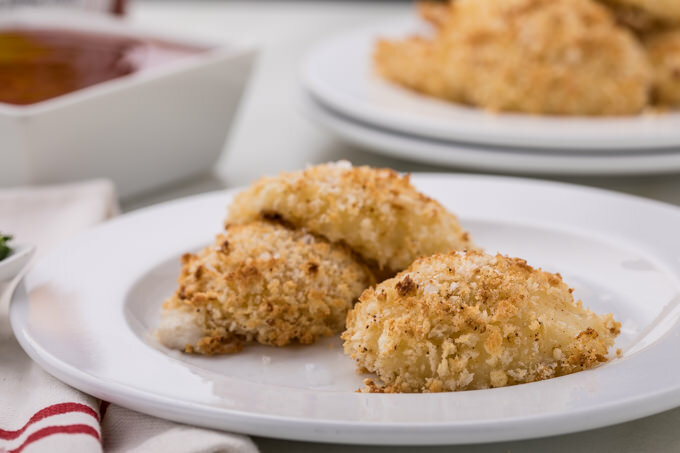 With these crispy bites, you’re sure to be the tailgate touchdown. 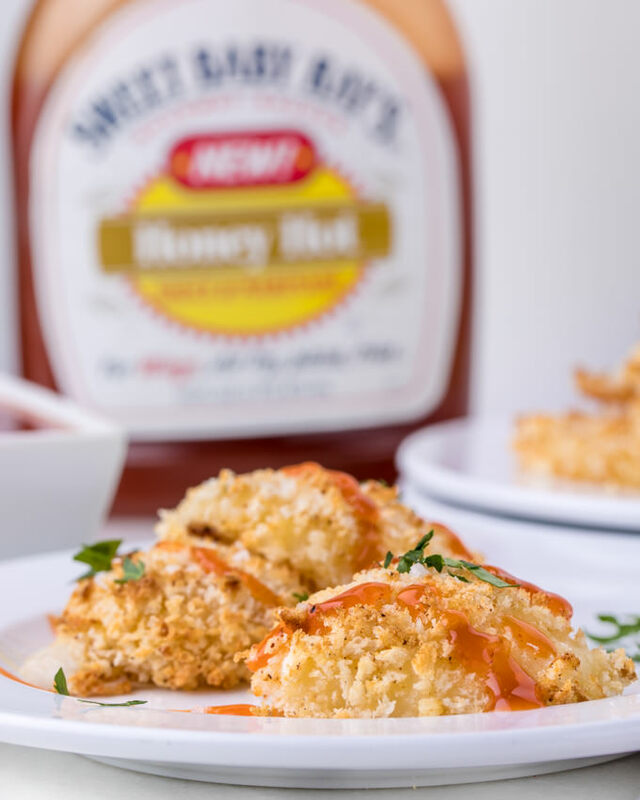 Crunchy baked cheese bites drizzled with a Sweet Baby Ray's Honey Hot Sauce drizzle. Perfect for game day! Prepare a baking sheet with parchment or silicone baking mat. Cut or prepare cheese into cubes or balls. Freeze cheese for at least 30 minutes, preferably an hour. In a dish, beat eggs and melted butter. 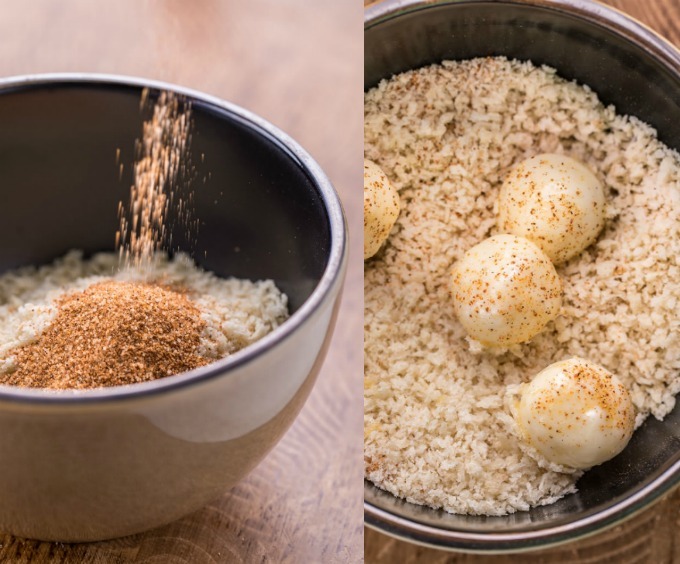 In another dish, combine panko break crumbs with cajun seasoning. Toss cheese in the egg wash, followed by rolling heavily in the bread crumb mix. Press mixture to coat well. Transfer each to the prepared baking sheet. Bake for about 4-5 minutes and then switch oven to low broil with pan in lower rack position if needed to give golden finish. 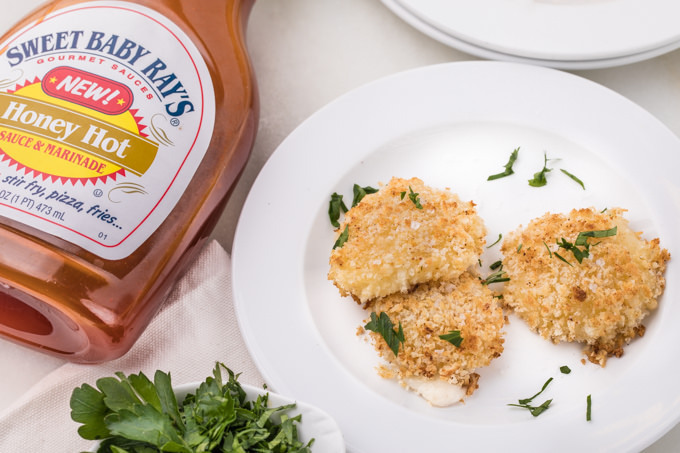 Drizzle, dip, or dunk into the Sweet Baby Ray's Honey Hot sauce and enjoy! Click HERE to see some other great party-ready recipes. 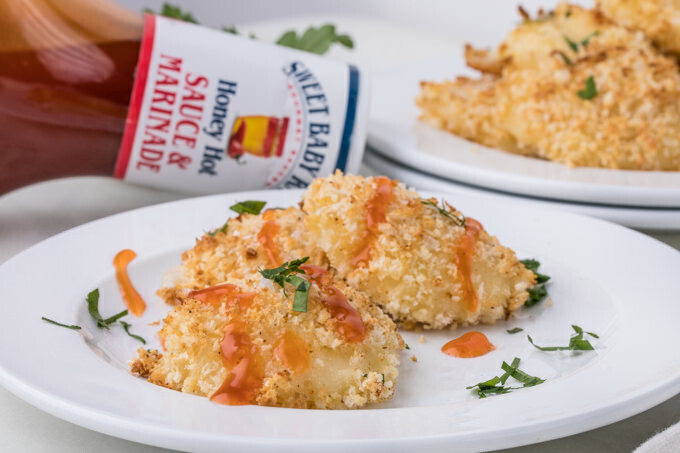 This recipe was made in partnership with Sweet Baby Ray’s. We love working with the brands that we truly enjoy and value and thank you for continued support to keep the blog kickin’ along. Our statements here are ours alone. Nothing like hot baked cheese! and with some sweet and spice…home run!!! Yum! You really can’t go wrong with hot, crispy cheese! I think everyone, deep down, knows that the tailgating/eating/drinking is the best part of football. I love Sweet Baby Ray’s sauce!!! 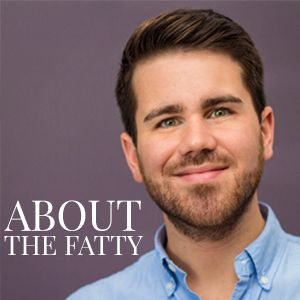 How could it not be amazing on some nuggets of melty cheese? I’ll probably drown them in it. Shooooo is! The first bite I made, I just dunked into the Honey Hot sauce. Ummm…it delivers on the hot promise. It’s SPICY in large quantities. Good stuff though. I’m hooked on their Sweet Vidalia BBQ Sauce right now too. I noticed you did a neat little drizzle, which I thought was very considerate. I just can’t get enough. I’ll look for that vidalia bbq sauce at Publix. Good stuff!